I have an area at the back of my place where all of our plants that don't survive in our other gardens or pots inside the house go to live out their final days. Some of them live on and prosper and thrive, and some die and become compost. Can you name the plants in this photo? There are more than 9. I will give you some help. The one on the top right in the square pot plant is mondo grass. The one half way done on the right is the Rio dipladenia Pink. There are 12 plants. That means there are 10 to go. 1. Top left hand side trunk is of a Camellia sasanque Exquisite that is approx 12 metre in height. 2. The plant in the pot on the left is a Tradescantia Spiderwort. 3. Top middle is a tree fern. Not quite sure what type. 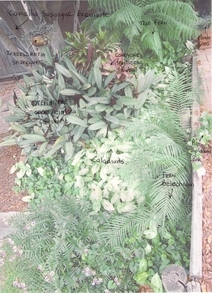 I have added the original photo that I took and have hand written the names of nine of the plants. There are three to go. Can you name them? Do you have a favourite visitors centre? What are the best chess pieces you have seen?